Leann Rimes is not currently scheduled to play in Branson. 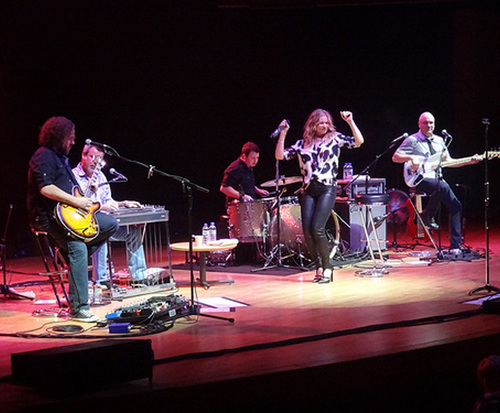 If you are a fan of country music, make sure to see Leann Rimes in Branson, MO; this country starlet is sure to impress with her famous hits and pop-country crossover music. Whether you like singing along to catchy pop tunes or prefer soulful sounds, LeAnn Rimes has something for everyone. Sing, dance, and tap along with some of her greatest songs like, "Blue" and "Hurt Me" while experiencing a performance you won't soon forget. Born in Jackson, Mississippi, Rimes' family moved to Garland, TX when she was six, where she enrolled in vocal and dance lessons and began performing in local talent shows. After nearly landing a lead role in the Broadway performance of Annie, she went on to appear on the television show, Star Search, and gained popularity. She released her first album in 1991 and released two others between 1991 and 1996. Eventually, she was discovered by Bill Mack, and her career hit the mainstream in July of 1996. "Blue" was released in 1996 to much critical acclaim. The album itself sold 123,000 copies in the very first week and peaked at number one on the Top Country Albums and number three on the Billboard 200. From 1997 to 2001, she cultivated much success crossing over into pop genres and covered many songs in a compilation album titled Unchained Melody. Releasing several studio albums following that success, she became a household name and a star in the industry. GMA Dove Award for Traditional Gospel Recorded Song of the Year for "Ready for a Miracle"